UCSD drops exhibition match against Division-I foe UC Irvine, trumps Winona State in first CCAA match of season. 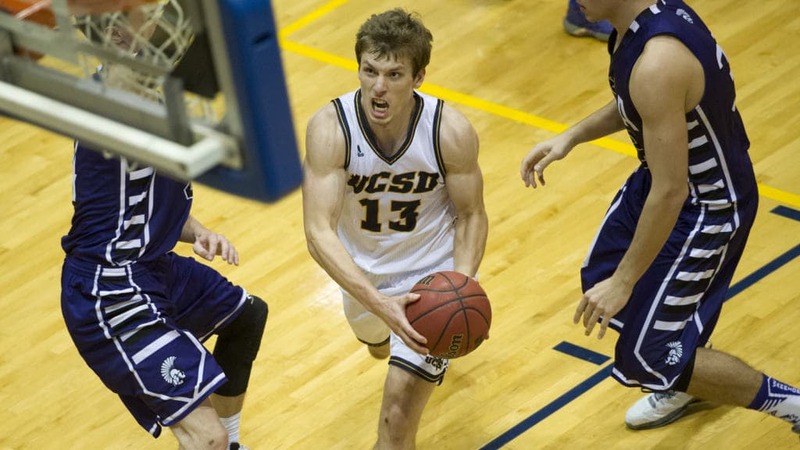 The UCSD men’s basketball team entered its exhibition game against UC Irvine, fresh off being voted to finish third in the California Collegiate Athletic Association Preseason Coaches Poll. The Tritons failed to produce, dropping the match to the Division-I Anteaters, but the team quickly turned things around, winning its conference, regular-season opener against Winona State on Tuesday night. The Tritons are now 1–0 in the CCAA to start the season, with Winona State dropping to 1–1. The Tritons got off on the wrong foot on Friday night in their exhibition against UC Irvine, allowing the Anteaters to go up 9–0 within the first two minutes. Unfortunately the Tritons did nothing in the first half to turn things around, as they fell behind by as many as 23 points, with the team shooting only 32.8 percent (9–28) from the field compared to the Anteaters’ 58.3 percent (14–24). The half was not without its bright spots, though. Junior guard Aleks Lipovic hit four out of five shots, with three from beyond the arc off of nine minutes of play. The team improved offensively in the second half, but it proved to be fruitless. Bringing the game within 13 points multiple times, the Tritons were unable to take the next step and bring the difference to single digits. The Tritons could not slow the Anteaters’ offense, allowing them to shoot 65.4 percent, compared to the Tritons’ improved shooting percentage of 44.1 percent. Despite the defensive showing, the Tritons’ improved offense allowed them to score almost twice as many points than in the first half, moving their scoring output from 26 to 47. UCSD ultimately lost the game 89–73. “We were a little bit shaky to start, but I thought in the second half we came out and played with a lot more aggression,” UCSD Head Coach Eric Olen told the UCSD Athletics Department. Lipovich led the team in scoring with 16 points off of 6–7 shooting, while junior guard Adam Klie led the team with five rebounds to go along with nine points and a team-high three assists. The team finished the game with a meager shooting percentage of 38.7 percent but made 11 out of 27 three-point shots for 40.7 percent. The team took advantage of its foul shots, making 14 out of 15. UC Irvine’s seven-foot-six junior center Mamadou Ndiaye led the team in points and blocks with 16 and six, respectively. Junior guards Jaron Martin and Luke Nelson, junior forward Ioannis Dimakopoulos and freshman forward Jonathan Galloway all scored in double digits. The match was an exhibition, so neither team’s record was affected by the results. Using the knowledge gained from their exhibition match, the Tritons achieved better results on Tuesday night. The team started the game with a bang thanks to a three-pointer by senior forward Drew Dyer, assisted by Klie. The first half was a back-and-forth affair with four ties and eight lead changes. However, after grabbing a rebound off his own missed shot, senior guard Hunter Walker put the team up 26–25 with 6:39 left in the half, a lead UCSD never relinquished. The two teams shot fairly evenly throughout the first half, with UCSD shooting 14–27 for 51.9 percent and Winona State shooting 11–22 for 50 percent flat. Both teams scored 14 points in the paint, but the Tritons took advantage of their opportunities, scoring eight points off turnovers compared to the Warriors’ two. During the second half, the Tritons took absolute control of the game. With the help of Klie’s 15 points off of 5–6 shooting, the Tritons dominated the Warriors on both ends of the ball. Holding the Warriors to just 6–22 for 27.3 percent, the UCSD men’s basketball team’s defense forced 11 turnovers, allowing the Tritons to score 17 points off of them. Leading by as many 22 points, the Tritons easily put the Warriors away 77–60. Klie led the team with team highs of 17 points, six rebounds and four assists, with Dyer right behind him at 16 points. Sophomore guard Grant Jackson and senior forward Zach McMillan both came away with five rebounds apiece. The team finished the game on 26–50 shooting and hitting 8–19 of its three-point shots. Winona State’s Mark Blacklock led the Warriors with 15 points on 6–11 shooting, along with four rebounds and four steals, but it was not enough to help the Warriors’ 17–44 mediocre shooting for the night. The Tritons host the 2–0 Colorado School of Mines on Sunday, Nov. 22.